A fine, and interesting, collection of shells. 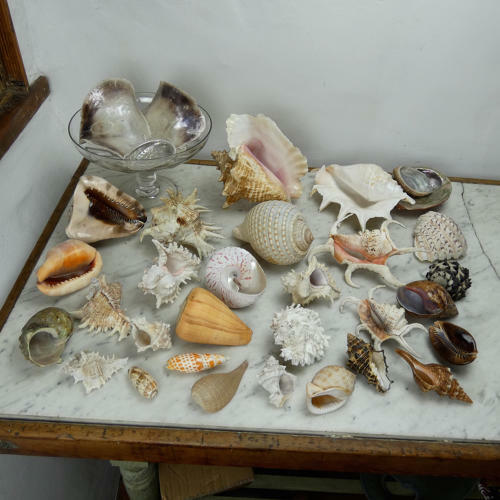 This collection consists of 32 shells, two of which are double sided, which were probably collected in the 19th century. The sizes of the individual shells range from the largest, which is 19cm. by 19cm. by 16cm. to the smallest which is 6.4cm. long by 3cm. diameter. Not being a conchologist I don't know the names of the various specimens but they are extremely attractive and decorative. There are a wide range of colours and shapes with some of the interiors of the shells being far more vibrant than the exteriors. Colours range from delicate pinks and oranges to striking dark browns and blacks and they also range in nature. Some are very heavy whilst others are very fine and delicate. One of the two part shells has a mother of pearl interior whilst the other has the most intricate layered exterior. They would make a really interesting display to fill a shelf or two in a display cabinet.